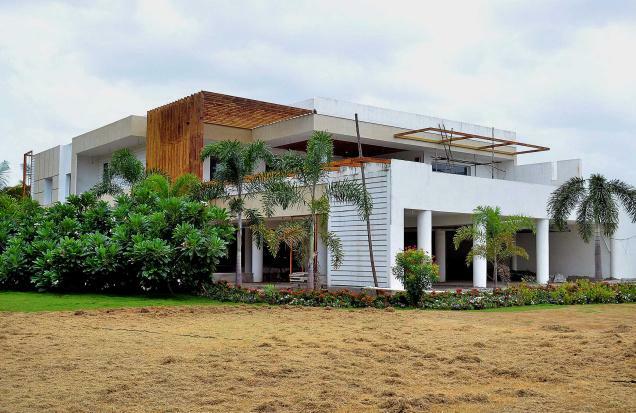 A division bench of Hyderabad High Court comprising Acting Chief Justice Dilip B Bhosale and Justice P. Naveen Rao on Monday directed the State government to respond to the case filed complaining that the Chief Minister’s house is illegal construction on the banks of Krishna river. The bench was dealing with the PIL filed by Mangalagiri MLA A. Ramakrishna Reddy (YSRCP). This house is in violation of rules as such things are not permitted on banks of rivers. The petitioner alleged that the Tehsildar had issued notices but there is no further action. The bench wanted to examine the bonafides of the petitioner too. The court specifically asked why the case is filed now. The case is listed next week. Mr. Ramakrishna Reddy has demanded that Chief Minister N Chandrababu Naidu vacate his riverfront guest house in the wake of the Hyderabad High Court directive. Mr Ramakrishna Reddy talking to The Hindu here alleged that the Tadepalli Tehsildar had issued notices but there was no further action. Mr Ramakrishna Reddy told The Hindu that the river front guest house of the Chief Minister was a violation of the River Conservancy Act, 1884. He said that this law enacted by the British was one of the few Acts that was not amended. The MLA said that he had written letters to the River Conservator (Executive Engineer –Irrigation), District Collectors of both Krishna and Guntur districts and the Commissioner of the Capital Region Development Authority (CRDA) about the matter and did not receive a reply. He approached the High Court only after that, he said. The MLA alleged that the government had already spent between Rs. 70 crore and Rs. 80 crore on the guest house that belonged to a local construction company to make it safe and comfortable for the Chief Minister. Ministers and officials renting houses and apartments that belong to the same company at high rates was “quid pro quo” for allowing the Chief Minister to use the guest house, Mr Ramakrishn Reddy alleged. Taking all this into consideration, the Chief Minister should vacate the guest house so as to ensure that officials of were free to submit a candid report to the High Court.